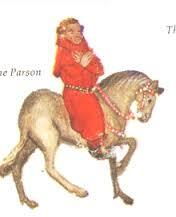 The Parson’s Tale, the last of the tales in the Canterbury Tales is also one of the longest, and perhaps driest. Its difficulty is found within its form – it is essentially a treatise on morality broken into various smaller sections that are laborious to keep track of. I have found many students give up reading only a few small segments into the tale, out of utter frustration. Here is a breakdown of the tale that I hope makes it easier to follow along. The Parson defines penitence – perfect penitence comes in three parts. Contrition is loathing of sin, with the goal of amendment, leading to eventual repentance. Both of these forms require self acknowledgement. You cannot feel sadness for having sinned until you admit it. Nor can you fix the problem until you come to terms with it. ~3. Yes, repentance solely out of fear for punishment is not ideal, but how can we ignore that we will eventually be judged? So he describes the darkness of Hell. ~5. Remembering that Christ died for your sins will drive you towards contrition because you do not wish his death to have been for nothing. The last section in the part on Contrition reminds us that Contrition, in order to be effective, must lead to Confession, otherwise it is for nothing – similarly Confession without Contrition is just as useless. Confession comes from true Contrition, both of which, due to our inherited original sin, are absolutely necessary for everyone. For example, when temptation presents itself, even if we only consider it briefly before turning it down, it is still a sin. Further, if we resist temptation, but then are delighted by our willpower, this is pride, and also a sin. The rest of this section will be an outline of the seven deadly sins. One of the differentiating traits of Envy is that it takes no delight in itself. When you practice gluttony/sloth/etc. you at least enjoy yourself while sinning. While practicing Envy you are in constant anguish as you covet what others have. Anger stems from the other sins. The worst part of experiencing anger is wanting to cause harm to someone else. This is not to be confused with good anger (righteousness) in which you are angry against wickedness. However, you should not be angry towards a person for being wicked, but towards wickedness itself. Anger can also lead to manslaughter – in this section there is an outline of the different types of manslaughter that can essentially be divided between physical manslaughter, and spiritual manslaughter. The last type of swearing is concerned with conjuring spirits. It must not be done unless it is done for an exorcism. Sloth comes from despair/loss of hope – you believe you have sinned so much you cannot repent, and thus become lazy in performing good works. Idleness is even worse than laziness. The first part was Contrition, or acknowledgement of sin. The second part is verbal Confession (continued from Part I). Once Contrition and Confession occur, you must do your penance for sins committed. In conclusion to the Parson’s Tale he ends with the statement that true penitence, when followed through the three stages on a regular basis is the road to salvation.